I've been interesting in sewing since I was old enough to thread a needle. No doubt this creative spark was initiated by my mother. MamaPeach always made my dresses when I was little. It was a yearly ritual to go to the fabric store and pick out our pattern and fabric for the Easter dress for myself and my two sisters. MamaPeach always told me that if I learned to sew she would provide all the patterns and fabric that I wanted. Santa brought my first chain stitch sewing machine when I was 8 years old. I've loved sewing all my life really. I am fortunate now to have space for my own creative studio. Sewing is not my only passion, but it remains a primary focus. 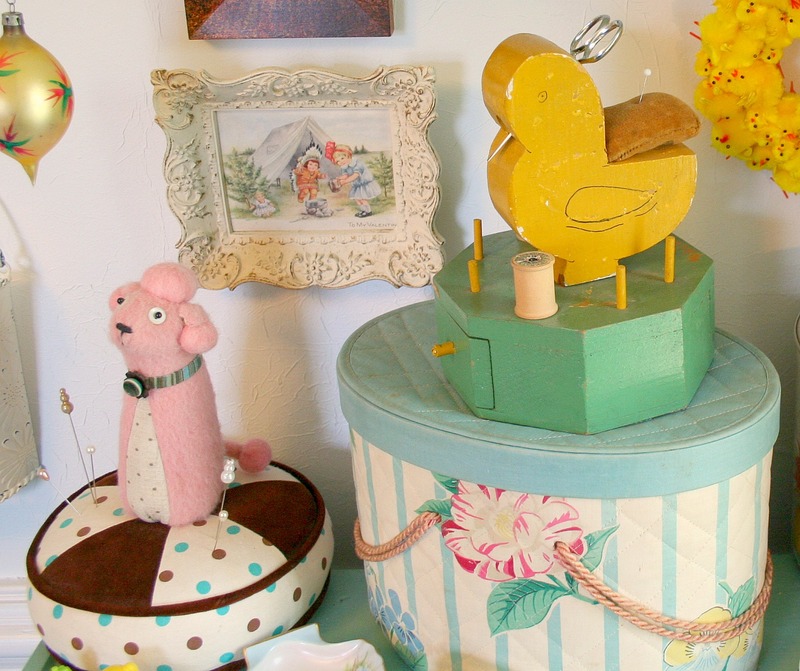 As I look around my studio I can see my pin cushion collection tucked into every corner. 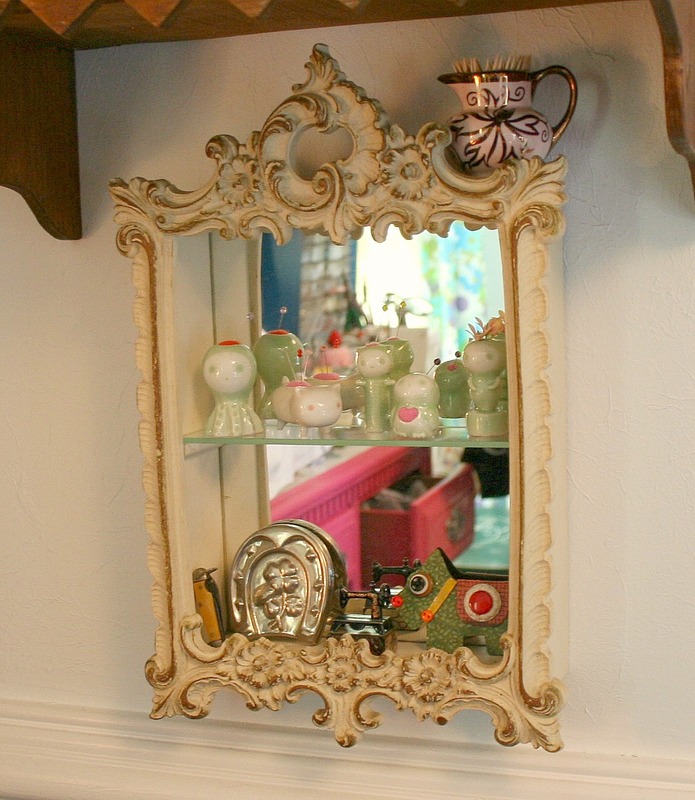 This fabulous estate sale find treasure box holds my collection of tiny porcelain pin cushions from this Japanese artist, Alleluja. 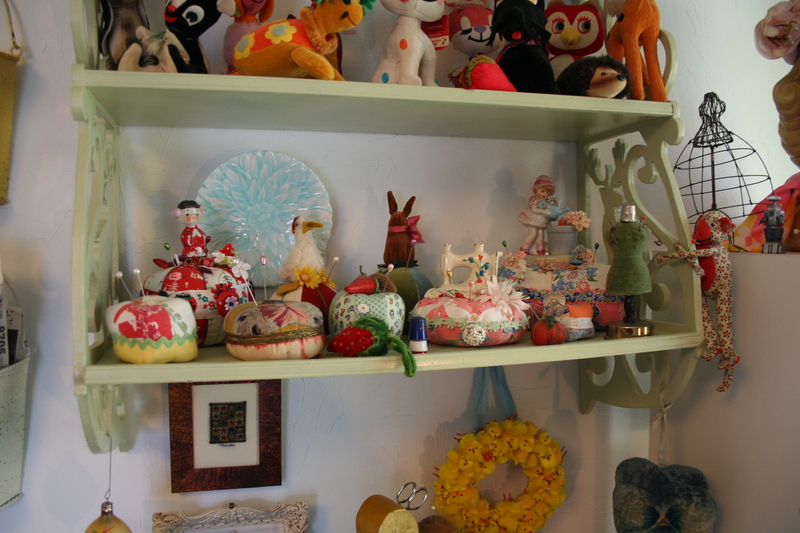 This shelf holds a collection of vintage pin cushions and custom pin cushions made just for me by my fabulous BFF, Beth. I have pin cushions everywhere. I couldn't get pictures of them all today, it's rainy and dark outside so half my pictures had to be trashed. 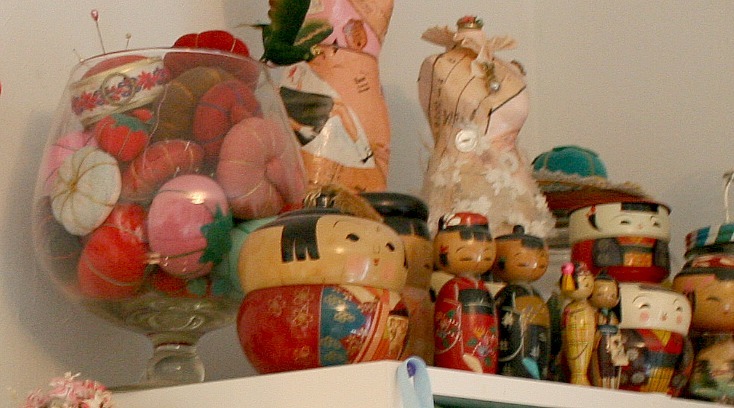 So, it just makes sense that I would have a ton of pin cushions, right? Thank you for a great pincushion tour. I am partial to the apothocary full of tomatoes. Heirloom tomatoes, judging by their colors! What a lovely collection, Suzy! I love your collection. My tomato collection looks lame by comparison!